The 1978 French Grand Prix was a Formula One motor race held at Paul Ricard on 2 July 1978. It was the ninth race of the 1978 World Championship of F1 Drivers and the 1978 International Cup for F1 Constructors. The 54-lap race was won by Mario Andretti, driving a Lotus-Ford, with teammate Ronnie Peterson second and James Hunt third in a McLaren-Ford. Following the voluntary withdrawal of the "fan car", Brabham had to revert to their previous car again, but it did not deter them, with John Watson on pole and Niki Lauda starting third behind Mario Andretti's Lotus. At the start, Watson led into the first corner, with Andretti following, and Patrick Tambay putting his McLaren in third, but that order did not remain for long as Andretti took the lead from Watson on the first lap. Lauda and Ronnie Peterson were on the move as well, as they passed Watson and Tambay to jump into second and third, but Lauda suffered another engine failure. This left the two Lotus cars running 1–2 and they finished like that with Andretti taking his third win in four races, and the podium was completed by James Hunt who passed Watson mid-race. Lap leaders: Mario Andretti 54 laps (1–54). ^ "Motor Racing Programme Covers: 1978". The Programme Covers Project. Retrieved 11 October 2017. ^ "1978 French Grand Prix". formula1.com. Archived from the original on 3 September 2014. Retrieved 23 December 2015. 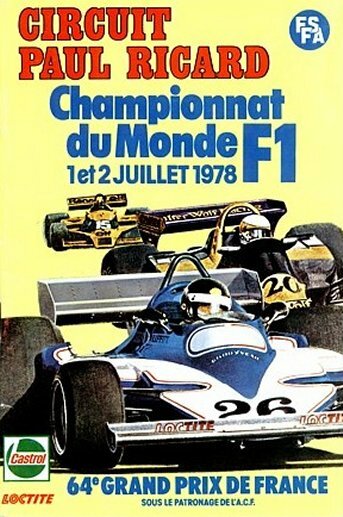 ^ a b "France 1978 - Championship • STATS F1". www.statsf1.com. Retrieved 17 March 2019.